By Dr. Tanya Atwater, Prof. Em., U.C.S.B. We in the California coastal regions live within the boundary between the two huge tectonic plates, the Pacific and North American plates. 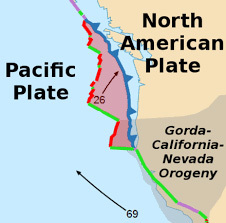 This plate boundary was first established about 25 million years ago, when the Pacific plate began to rub against the continent off southern California and northern Baja California. The earliest boundary was short and lay offshore at the very edge of the continent. With the passage of time, the boundary drifted up coast, grew in length, and broke ever more deeply into the continent, transferring pieces of continental crust to the Pacific plate. At present, the main plate boundary, the San Andreas fault, lies well inside the continental edge and the topography west of the fault was formed during the past history of deformations as the plate boundary worked its way into the continent. Two topographic anomalies in southwestern California reflect the evolution of the plate boundary here. One is the east-west orientation of the “Transverse Ranges”. 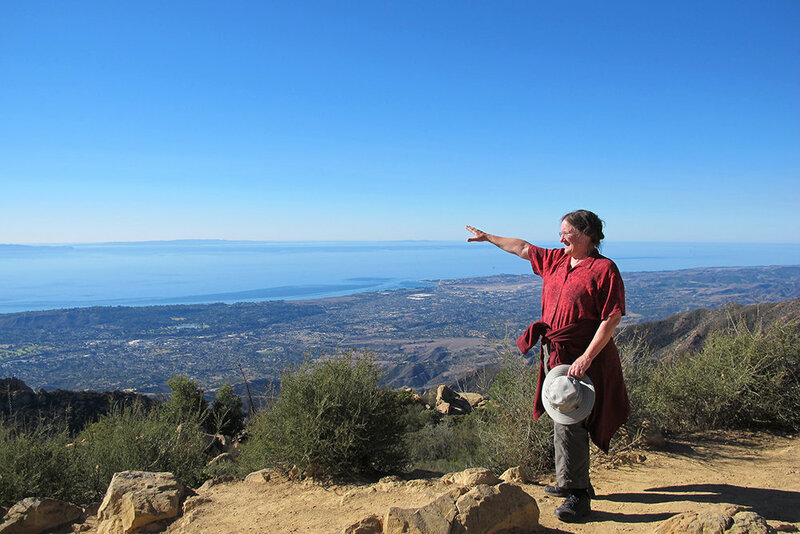 These include the Santa Ynez, Topa Topa, and Santa Monica mountains, the Hollywood Hills, various east-west coastlines, and the four northern Channel Islands: Anacapa, Santa Cruz, Santa Rosa and San Miguel. Most of the rest of the topography along the entire west coast of the Americas lies approximately parallel to the continental edges. The other distinct anomaly is the nature of our continental shelf, the “California Borderland”. Most of the world’s continental shelves are shallow and quite smooth, while ours is very wide and is broken up into many blocks and deeps. The Channel Islands are just mountain tops, formed by some of these blocks that happen to stick up above present sea level. The east-west orientation of the Transverse Ranges and the chaotic topography of the California Borderland are direct results of the motion of a continental piece, the “Transverse Ranges Block”, that got caught between the large plates and was twirled around clockwise 90-120 degrees. 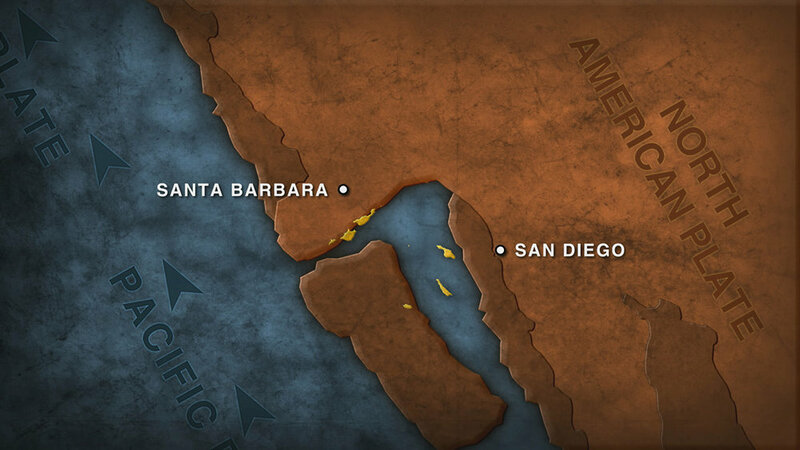 The four northern Channel Islands presently occupy the southern edge of this rotated block, but their rocks started out on a north-south line west of San Diego. Starting in the Miocene Epoch, about 18 million years ago, the Pacific plate snagged the southern end of the block and began to pull it out and rotate it around. It is highly likely that all the islands were completely submerged during this early rifting and stretching of the crust. This is important since it means that none of the land plants and animals presently found on the islands are directly descended from pre-rift inhabitants. The Transverse Ranges block is still rotating. Its northern edge is colliding with the continent - uplifting the Santa Ynez and Topa Topa mountains - while its southern edge is being rammed by other pieces moving with the Pacific plate – uplifting the four northern Channel Islands and the Santa Monica mountains along that edge. The other four Channel Islands lie south of the Transverse Ranges block and have variable histories. 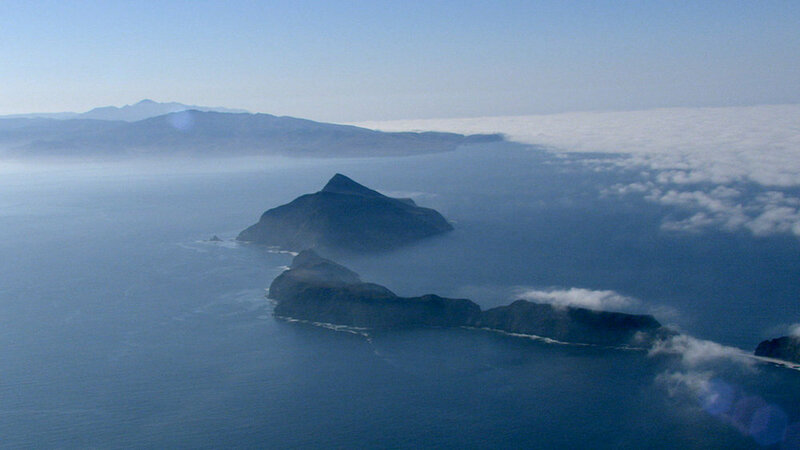 San Nicolas, Santa Barbara and San Clemente Islands lie near faults in (non-rotated) broken pieces of the continent. 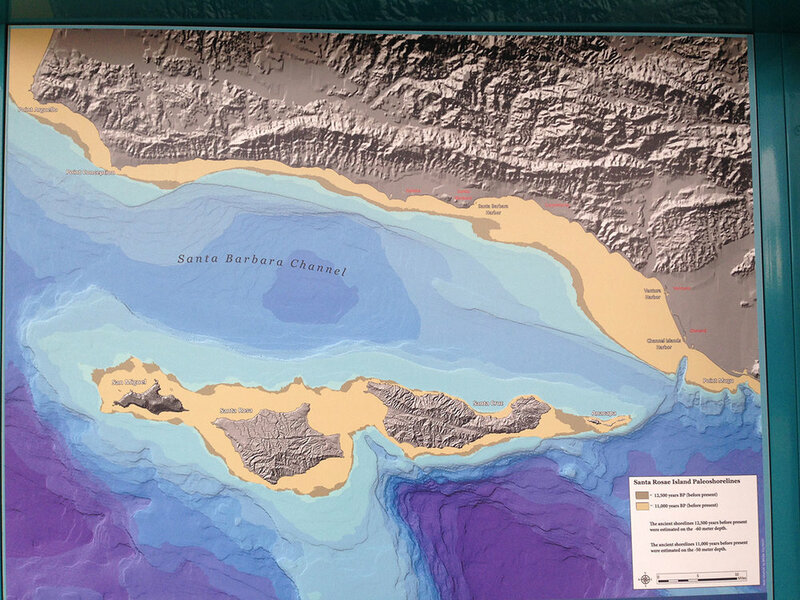 Santa Catalina island and also the Palisades Peninsula are made of metamorphic rocks that oozed up from the deep crust to fill the hole when the upper crust was pulled apart. Most of the islands are completely or partially draped with Miocene lava flows and volcanic ashes. These volcanic rocks came from eruptions that occurred early in the rotation history, when the crust was being rifted apart, allowing deep, hot rocks to ooze upward into the gaps and melt. The geography of the islands was very different during the Ice Ages. When water was stored on the land in thick glacial ice caps, it was removed from the ocean and global sea level was lowered. At the height of the last Ice Age, about 20 thousand years ago, sea level was 120 meters lower than present. That is almost 400 feet! This sea level drop uncovered more of the submerged continental pieces in the borderland, making some new islands appear and increasing the areas of all of the present islands. The four northern islands are surrounded by lowlands that were uncovered, so that they merged into one big island, dubbed “Santa Rosae”. Dramatic as this was, there is no evidence that any of the islands had a dry-land connection to the mainland, so we must assume that all the plants and animals on the islands were able to cross ocean waters by some means, floating or flying, with or without human help. Luyendyk, B. P., 1991, A model for Neogene crustal rotations, transtension, and transpression in southern California: Geological Society of America Bulletin, v. 103, p. 1528-1536. Hornafius, J. Scott, Luyendyk, B. P., Terres, R. R., and Kamerling, M. J., 1986, Timing and extent of Neogene tectonic rotation in the western Transverse Ranges, California: Geological Society of America Bulletin, v.97, p.1476-1487. Patrick L. Abbott, 1999, The Rise and Fall of San Diego, Chapter 5, p 85-104. For a display of a pygmy mammoth skeleton and accompanying video kiosk, visit the Channel Islands National Park Visitors’ Center in the Ventura Harbor. The Santa Barbara Museum of Natural History Museum also has a pygmy mammoth display.